It's a brand new way to play the classic property trading game! Be the first in this card game to get a million dollars in your bank pile and win MONOPOLY Millionaire Deal! Pick up cards when it's your turn and play any combination of Money, Action and Property cards. Don't hesitate to steal a property or set of properties from another player if you get the right action cards, but hang on to the Just Say No card in case someone tries to do the same to you! Build up property sets, gather piles of money and keep wheeling and dealing to make that million! 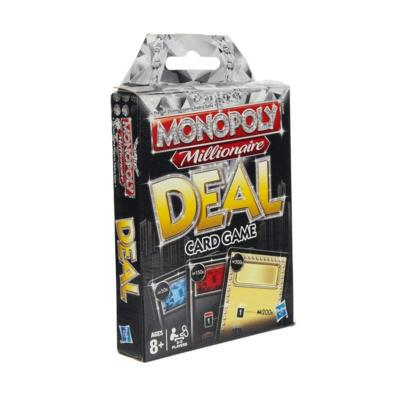 Win the MONOPOLY Millionaire Deal card game by making a million dollars! Earn and swap properties and charge other players rent! Steal properties or sets of properties from other players when you get the right Action card! Just Say No card protects you from other players' thefts!